Probably the next simplest way to cook an oyster, and the one most commonly accepted in restaurants, it to fry him. It is too bad, since the method can be good, that so many chefs dip their oysters in a thick and often infamous batter, which at once plunged into the equally obscene grease, forms a envelope of such slippery toughness that the oyster within it lies helpless and steaming in a foul blanket, tasteless and yet powerfully indigestible. When I revisited this recipe “to friy oyesters” from UPenn Ms Codex 252, I was certain I could accomplish the latter: fresh oysters, good fat, a seasoned crumb, and a quick fry. Indeed, it took far longer to shuck the oysters from the fish market than to cook this recipe. I was first intrigued this simple recipe when I was setting up the social media accounts for this project back in 2014. This humble receipt has graced the @rare_cooking Twitter avatar ever since. It is written on a small slip of paper that was once pinned into the manuscript – take a look at the pin holes above and below the text. Although the receipt is written on a scrap, the handwriting and inconsistent spelling are similar to one of the manuscript’s dominant hands. In this simple recipe, the oyster stands on its own. Seasoned with nutmeg, salt, and pepper, and frazzled in butter, these fried oysters are truly delicious. Combine the breadcrumbs and seasoning in a shallow bowl. Beat 1 egg in a shallow bowl. If one egg does not coat all your oysters, you may need to add a second egg. Heat a cast iron skilled (or your preferred frying pan) on high for 2-3 minutes. Reduce to a medium heat. Add the butter and let it melt and foam. Dip the oysters in the beaten egg and then the seasoned breadcrumbs. Put each dipped oyster straight into the frying pan. Do not crowd the oysters. Cook for 2-3 minutes and flip each oyster mid-way through to allow both sides to brown. Eat immediately. Dress with lemon to your taste. I’m glad that I have a new way to cook and eat this glorious mollusk. Half of the cookbooks in my house are out. They’re opened to enticing recipes and stuffed with paper bookmarks. My spouse and I are hosting Thanksgiving for the first time and our imaginations are running wild. Thankfully, we’ll have some help from guests with crucial dishes. Since the early modern recipe books that I’m researching are from England, Scotland, Ireland, and Wales, they do not dwell on Thanksgiving in the same way that they celebrate holidays like Christmas or even seasonal changes associated with planting and harvest. These recipe books show the slow importation and integration of ingredients from the Americas such as chocolate, potatoes, tomatoes, rice, and, of course, sugar, but you won’t find cranberry sauce or pecan pie. These family manuscripts do, however, include many dishes that would be welcome on a Thanksgiving table. I’ve been looking back over recipes on this site for carrot pudding, caraway buns, macaroni cheese, and stewed peas that will compliment the yams, green beans, and turkey. This turnip and carrot side dish that I found in Lettice Pudsey recipe book, now Folger Shakespeare Library MS V.a.450, fits the bill. Pudsey includes the date 1675 in her cookbook and the recipes in it are a range of late seventeenth-century favorites. These savory and flavorful root vegetables make a delicious dish to be served with roast meat or on its own. Turnips sometimes get bad press, but they’re packed with flavor and grow wonderfully throughout Europe and Asia where they have been cultivated for ages. Deborah Madison’s brilliant cookbook Vegetable Literacy and my spouse’s roasting efforts have taught me to love these humble root vegetables. Vinegar elevates this dish and harmonizes the flavors. The butter and eggs compliment the turnip’s sharp flavors and the carrots add sweetness. To learn more about how our carrots became sweet and orange, listen to this fascinating episode of the Gastropod podcast that blew my mind earlier this month. 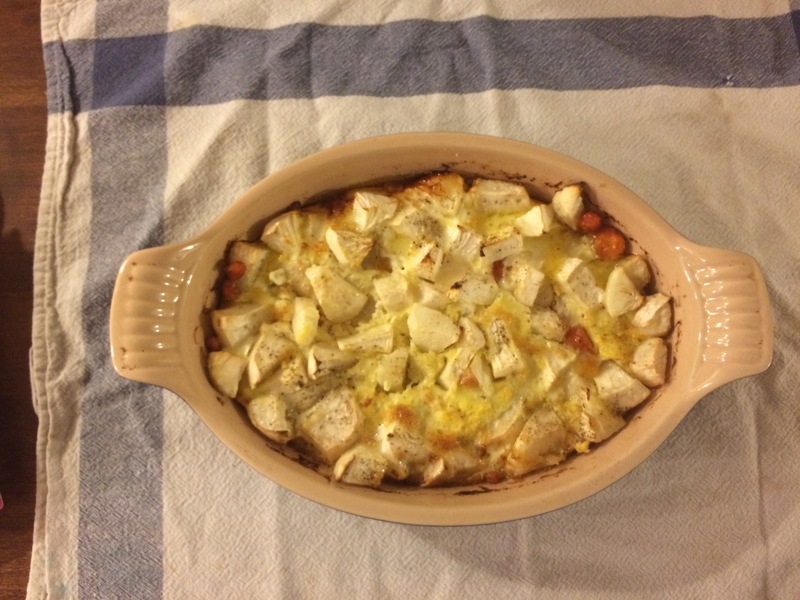 I roughly halved the original recipe to make this in a small casserole dish. This dish can easily be prepared in advance. It reheats beautifully in an oven or microwave. Preheat your oven to 350F. Prepare a buttered casserole dish. Clean and peel the turnips. Cut them in half and then in pieces. The number of pieces will depend on the size of your turnips, but the resulting pieces should be bite size. Clean the carrots. Peel them if you prefer to do so. Cut into rounds 1/4 inch thick. Put the vegetables in the prepared dish. Season with pepper and salt. Dollop the butter on top of the vegetables. Pour the eggs over the dish evenly and allow to settle amongst the vegetables. Bake for about 50 minutes until the eggs are starting to set and the vegetables soften. Add the vinegar. Cook about 20 minutes more until the dish is golden and bubbling and the vegetables are tender when poked with a fork. This is comfort food: rich, flavorful, sweet, savory, and satisfying. The eggs and butter mollify the turnips without disguising their distinct tang. Carrots and vinegar add brightness to a dish that would otherwise be stodgy. 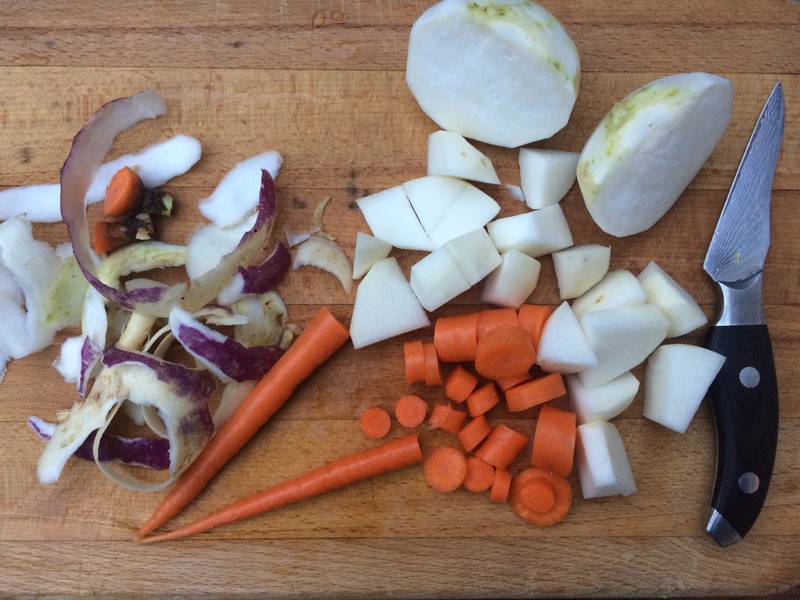 These turnips and carrots would stand up alongside roast beef, a cooked chicken, pork sausages, or even, roast turkey. I visited the Folger Shakespeare Library a few times over the summer to develop updated recipes for an upcoming exhibition, First Chefs: Fame and Foodways from Britain to the Americas. 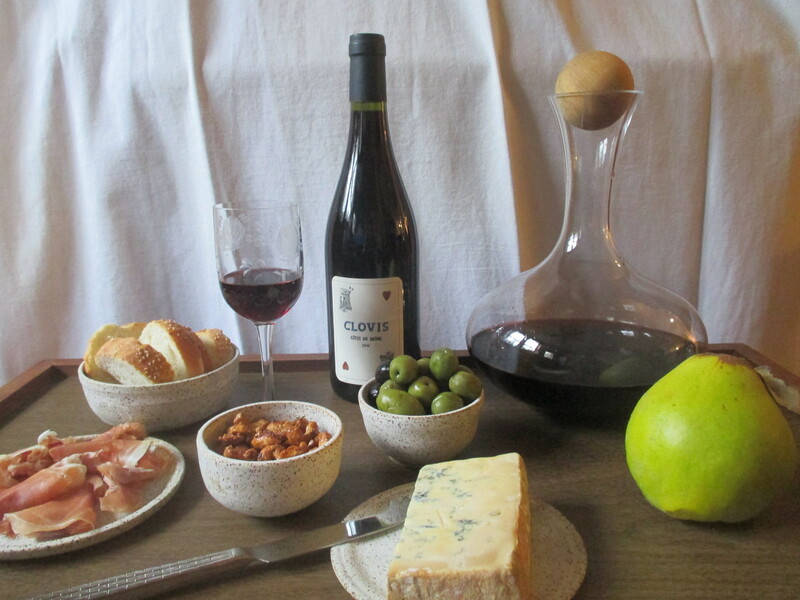 I cannot wait to share these recipes with you this winter. If you live in DC or plan to visit, make sure you check this out! 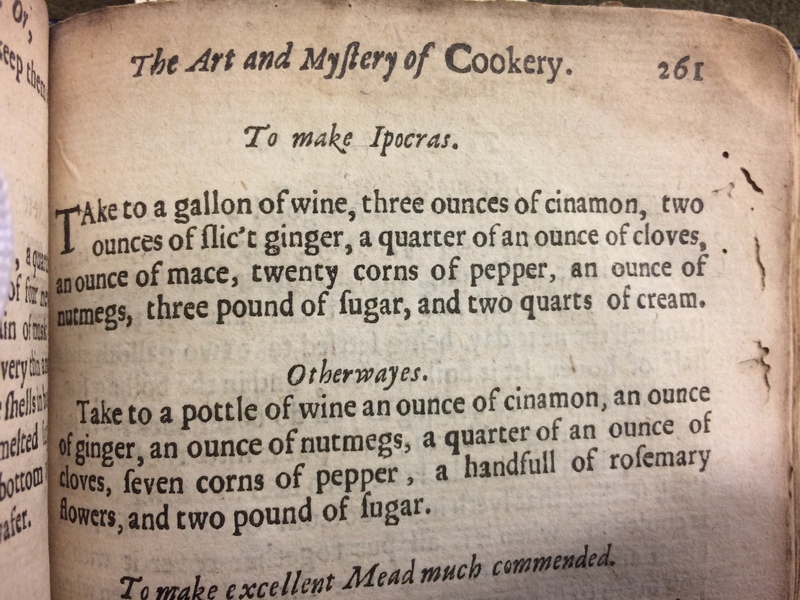 As I looked at printed books and manuscripts that had been selected for display in the exhibition, I had the pleasure of revisiting Margaret Baker’s recipe book, Folger V.a.619. I’ve previously worked on this book with undergraduate researchers and I wrote about it here. 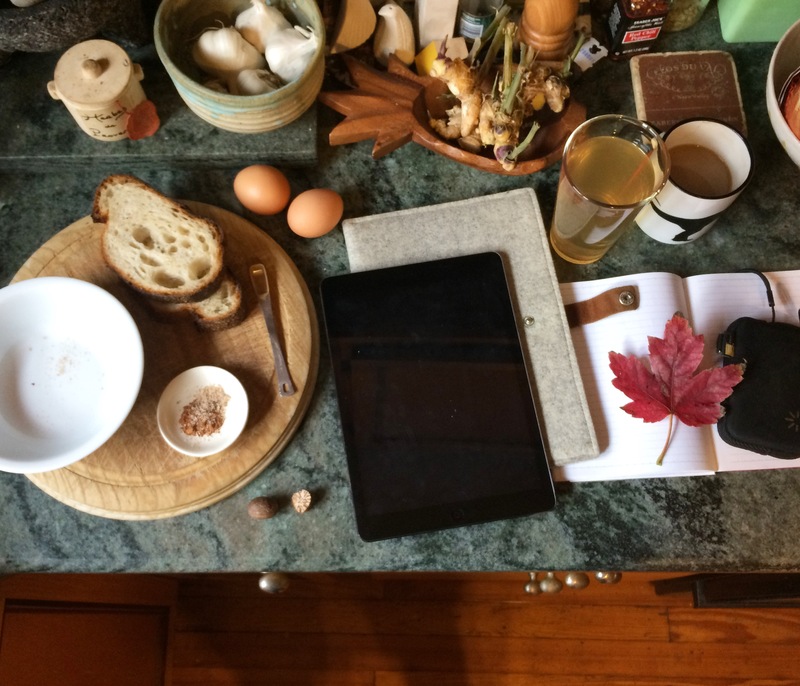 Reading through the manuscript again, I noticed a medicinal recipe that looked decidedly scrumptious: toasted manchet bread with egg and spices. As a devotee of toast in all its glorious forms, I knew I had to test this one. This recipe is “for the weakness of the back” and calls for bread, egg yolk, cinnamon, and nutmeg. These spices are known for their warming and energizing qualities. From my preliminary research on humoral medical treatments, I gather that the cinnamon and nutmeg might strengthen a phlegmatic patient by warming the body and reducing phlegm. The instruction to eat this first thing in the morning might help the patient disperse phlegm that had accumulated in the back of the body overnight. I tested this recipe on a chilly morning and quickly devoured a slice with a cup of coffee. Somewhere between French toast and cinnamon toast, the combination of the rich egg yolks and the warming spices was delightful. The original recipe calls for raw egg on toasted bread sprinkled with spices. I assume that bread toasted on a hearth would be quite hot and would interact with the yolk. Cooking mine in a skillet on a conventional stove, I opted to add butter and cook the eggy side of the bread, too. 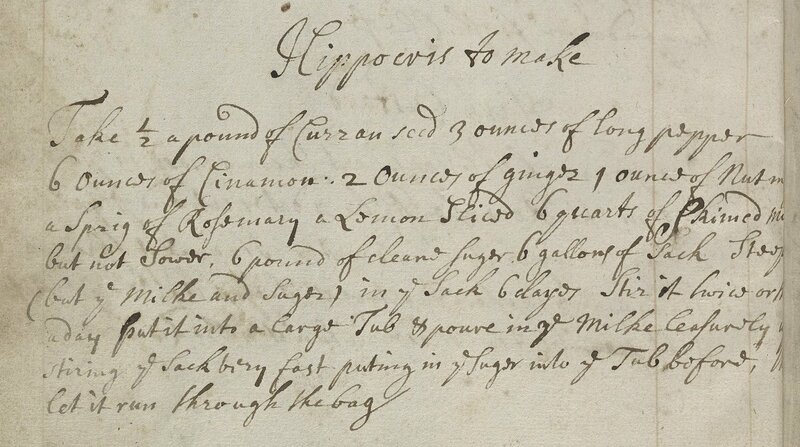 This is a recipe I would love to try again on a hearth or open fire. I hope some of you do so and tell me about it in the comments! Heat a heavy pan and add the butter. (I used a cast ion skillet.) Toast one side of the bread in the butter, then flip. Mix the egg yolks with the spices. Spoon over the first, toasted side. Flip when the bottom is toasted and quickly cook the eggy side. Last week, I spent a few hours typing up recipes that were originally written in a lovely, erratic cursive in Jane Dawson‘s cookbook. 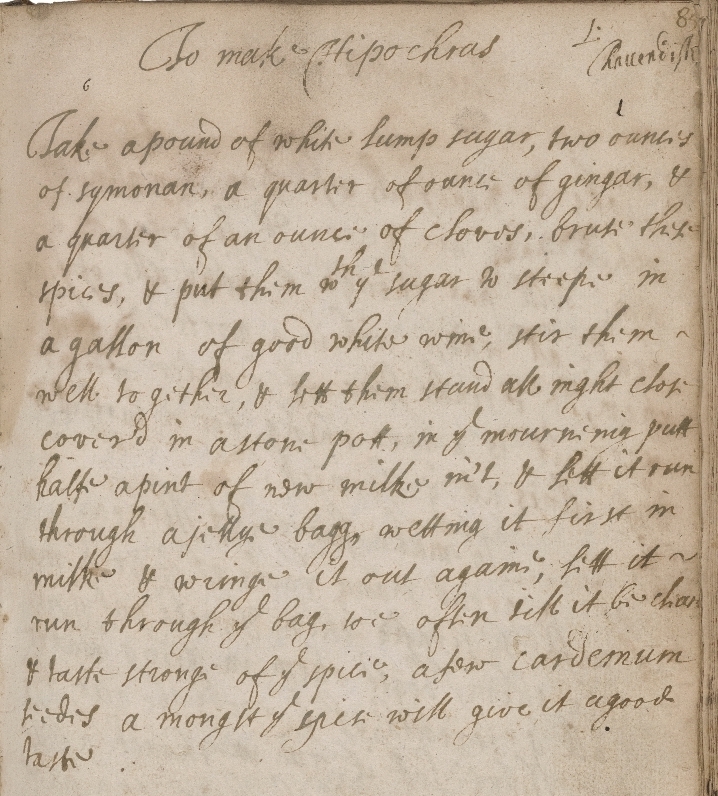 Dawson’s manuscript cookbook is held at the Folger Shakespeare Library, but I was transcribing recipes into readable pixels alongside students and colleagues on my campus as well as participants located all over the country and around the world. This year’s “Transcribathon” was both successful and energizing. We completely transcribed Dawson’s book and, as you may remember from my previous discussions of early modern handwriting, this is not a small achievement. Participants were also inspired to try some of Dawson’s recipes in a Cook-Along. Both the original transcription event and subsequent cook-along were organized by the Early Modern Recipes Online Collective, ie. EMROC. How could I say no to a Cook-Along? Although the coordinators suggested trying a recipe for Lemon Wafers, I was intrigued by a mushroom recipe that I’d transcribed: “To Order Mushromes.” First of all, the recipe sounded tasty. Mushrooms with onions, herbs, and spices? 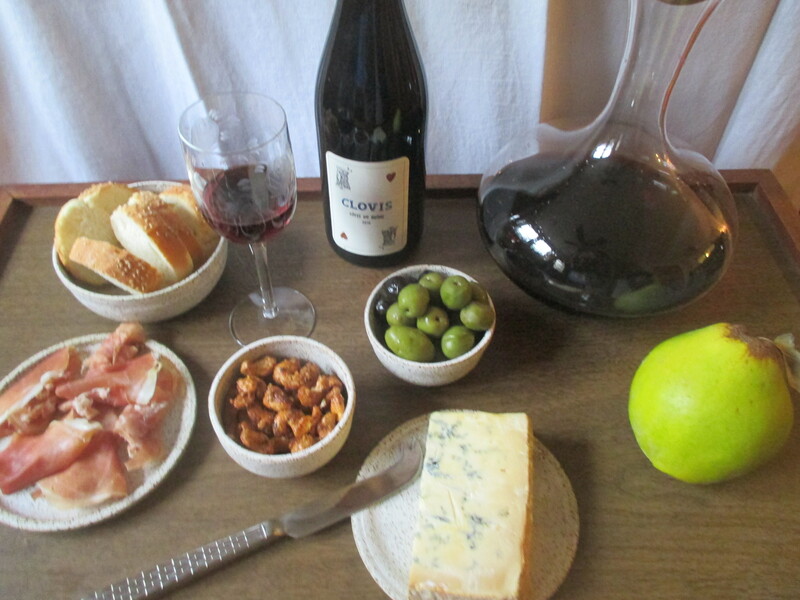 What could be more delicious and comforting as the temperature dropped and the autumnal equinox came and went? But I was also intrigued by Dawson’s use of “order” as a culinary verb. I imagined regimented mushrooms aligned in neat rows on a cutting broad or chopped into impossibly regular slices. Of course, none of these senses of “order” operate in Dawson’s recipe. Instead, as the Oxford English Dictionary informed me, Dawson was using an obsolete definition, “To put in order or readiness (for a purpose); to make ready, prepare,” that was often used in culinary contexts. This lovely dish is not especially orderly, but it is a wonderfully simple preparation for mushrooms. Slowly cook the mushrooms with seasonings. Then flavor the rich broth with stock and egg yolks. A simple and delicious mushroom preparation. I decided to use the “sweet herbs” sage and thyme because both are going wild in my container garden right now. Chop the mushrooms and onion. Put these vegetables, the fresh herbs, seasonings, and water into a heavy pot and place on the stovetop. Cover and simmer for 12 minutes. Then remove the lid and simmer for an additional 18 minutes. Remove the herb stalks with tongs. Add the broth and simmer for 5 minutes. While the broth simmers, temper the egg yolks with some of the cooking liquid. This should help prevent the yolks from cooking instead of thickening your broth. Remove the pot from the heat and slowly and gently add the egg yolks. 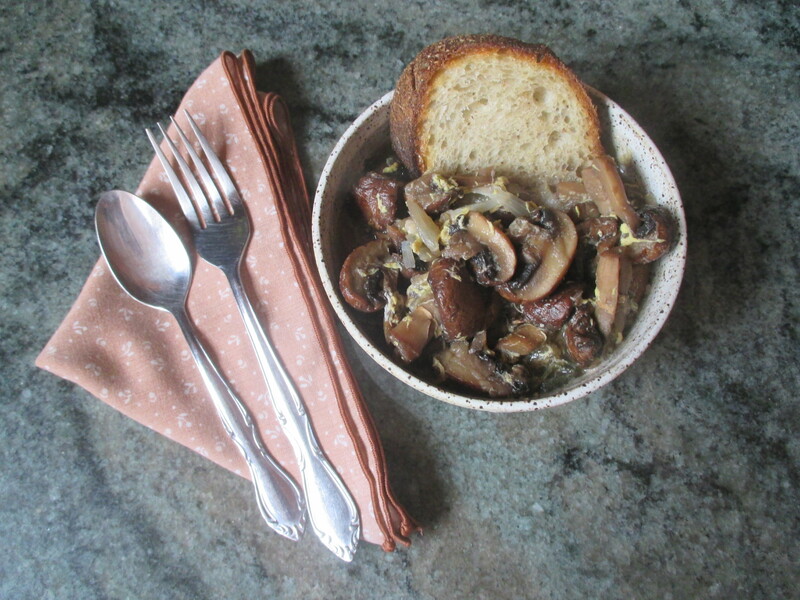 Easy, satisfying, and endlessly adaptable, Dawson’s recipe for ordering mushrooms makes a wonderful main or side. I could imagine serving this alongside polenta or freshly baked biscuits. 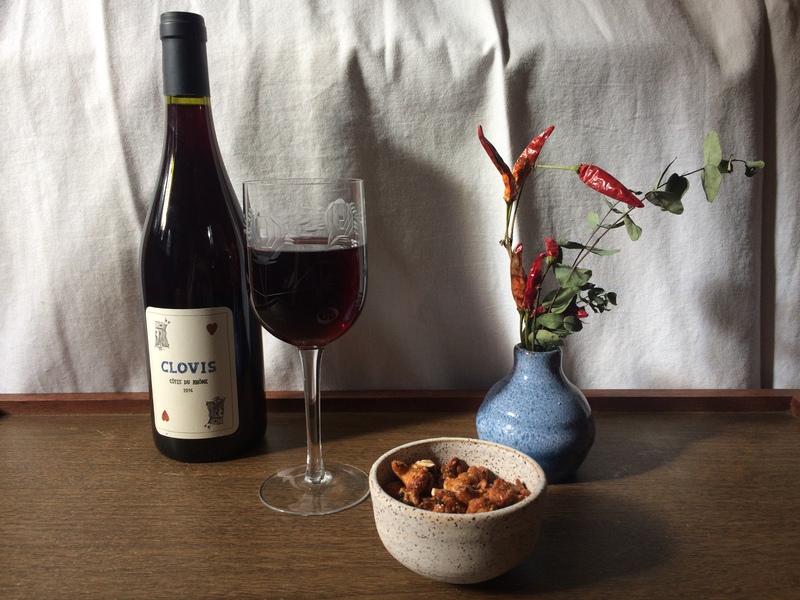 I can see myself pairing this with braised collards or a kale salad. I would eat this alongside a delicious roast chicken and creamy mashed potatoes. Dawson’s mushroom recipe is vegetarian friendly as long as you use a strong vegetable broth and you can easily make it vegan by leaving out the egg yolks. A confession: As you might have noticed from the photos, my egg yolk turned into scrambled egg in the hot liquid despite my best efforts. Luckily, I’d planned to eat my mushrooms with toast and eggs for lunch.